Have I told you about the amazing book Lily Vanilli’s Sweet Tooth? Subtitled ‘recipes and tips from a modern artisan bakery’ it is an incredible collection of fantastical baked goods with gorgeous photos to match. I was sent a review copy in my day job as a journalist and I couldn’t wait to get this book into my kitchen to try out the recipes. If you have a loved one who is into baking, buy them this book. 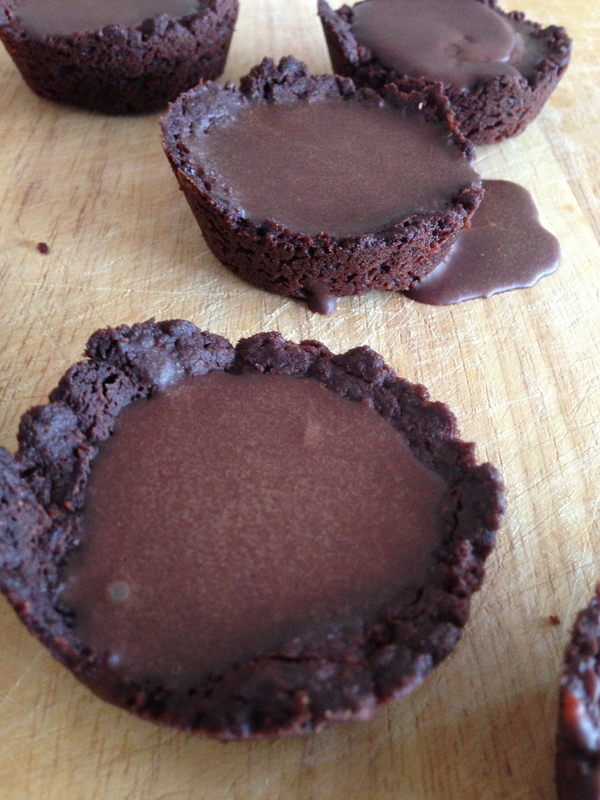 I chose the ‘hot toddy tarts’ as my first foray, as I love the idea of alcohol in baked goods. Maybe it is the lush in me, or maybe it is the extra dimension of taste that booze brings, but I just love adding the hard stuff to cakes and tarts. These lovely wintery tarts use a super simple pastry that requires no fussiness – you don’t need to rest it and knead and spend yonks getting it right. It is a bit rustic but it tastes fab. The book serves these with home-made caramelised lemon slices but I skipped this [coz I’m lazy]. Cream butter and sugar in bowl of electric mixer until combined, about one minute. Add flour, cocoa powder, salt and vanilla and beat until it just comes together in a crumbly mess. Press into base and sides of muffin tray [line holes with crosses of baking paper, allowing some overhang, for easy removal] and place in fridge for 30 minutes. Line with baking paper and fill with baking beans and blind bake for 15 minutes. Remove beans and paper and smooth surface of shells using back of spoon, then bake for another 10 minutes, then place on wire rack to cool completely. To make filling heat cream in pan until it starts to simmer then remove from heat and add chocolate. Leave to melt for a minute then stir until melted. Whisk in burnt butter, whisky and salt and combined. 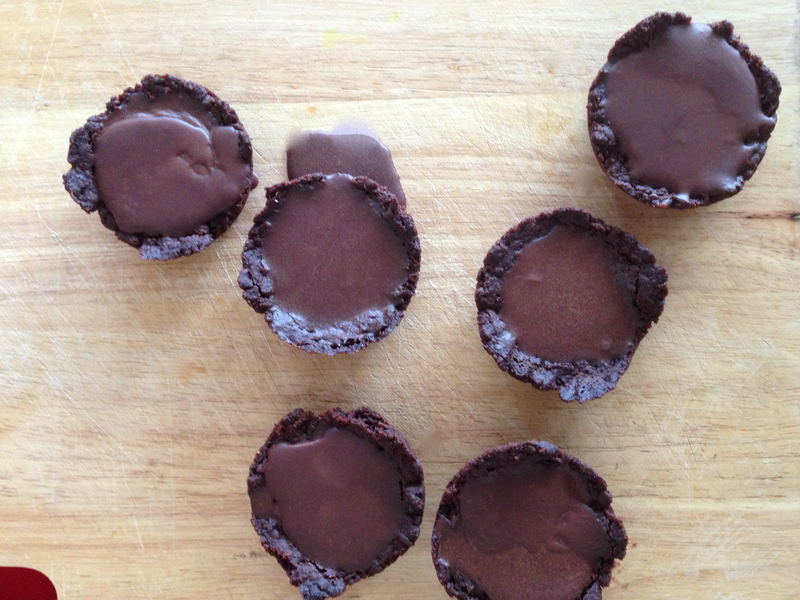 Allow to cool then pour into tart shells. Serve with double cream, or as is. Cor – sounds like a great adult treat! This sounds marvelous. I don’t care to drink at all, but I also love any kind of recipe that includes alcohol in some form. I have a pretty substantial stash of bottles to use in great dishes like this. I want these chocolate treats in my face, right now! Mmmm, chocolate and whisky sounds like a marriage made in heaven. Will give this a go soon. These look very incredible! Yum! Cheers! They are such a decadent treat. You can’t be too lazy if you made these 🙂 Love ’em and I feel exactly the same way about enjoying booze in baked goods. These for sure go on my to-make list. Thanks for a great post! Ooh, thanks! Fairly sure I’m the laziest person on the planet 🙂 Hope you get to make these son. Wow – these are brilliant! I’m accustomed to recipes requiring just a touch of liquor. These need a bit more than a touch or whiskey. I bet they’re fantastic! alcohol and chocolate … sold baby! Yeah, putting those two things together is pure genius! I love the oozey bits! Oozey bits are the *best* bits! I reckon eating a hot toddy tart when you feel unwell would be just what the doctor ordered! I mean chocolate is it’s own food group, right? My son would like us to make a treat to bring to his class for his birthday–I wonder if I can pull this one off? Maybe just the teachers. Course you can pull it off! Piece of cake! Def one for the teachers only, though! I love Lily Vanilli’s baking, and have read my copy of Sweet Tooth from cover to cover! I’ve featured a few of her recipe’s on my blog too – my favourite being the beetroot and raspberry cake with mascarpone icing. At least that’s my favourite today…!! Oh wow they look so good. The name hot toddy always makes me laugh 😛 These look incredibly mourish! oooh, I just don’t know! Try it [guinea pig!] & let me know – will be interested in seeing if it works. Is a pretty fab combo 🙂 They taste *amazing*. Hi there – these sound great – though I am not a huge whisky fan, I do like the idea of something boozy in the ganache! may have to look and see what bottles I can find at the back of the cupboard! These would be delicious! The whiskey would be a great surprise! I think I love you and your blog. So many amazingly delicious recipes! Wish there were more days in the year so that I could try them all. Reblogged this on the hungry mum. All about the bite sized treats, less obvious when you chomp through them. 🙂 Especially when they are loaded with booze.